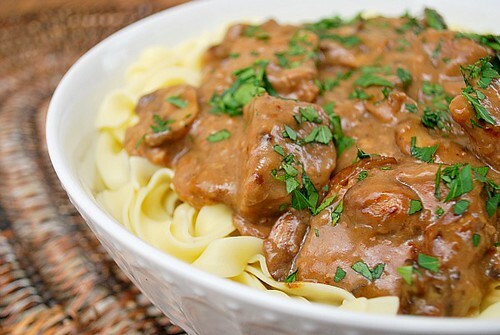 This recipe deconstructs the dish in two parts - steak and mushroom sauce. The steak is marinated in soy sauce and pot seared. Once the steak is done and removed from the pot, onions and mushrooms are thrown in to sauté, picking up any leftover fond from the steak. The steak is sliced and added back in for a few minutes to pressure cook and finally a simple sauce is made in the same pan with tomato paste, flour, wine, beef broth and a mustard paste. Just before serving, a touch of sour cream and wine are mixed in to give it a nice depth of flavor and creamy texture. Seriously, it's comfort food at it's finest! Using fork, poke each piece of steak 10-12 times. Place in baking dish; rub both sides evenly with soy sauce. Cover with plastic wrap and refrigerate at least 15 minutes or up to 1 hour. Combine water, dry mustard, sugar, and 1/2 tsp pepper in a small bowl until smooth paste forms; set aside. Pat steak pieces dry with paper towels and season with pepper. Press SAUTE and add oil. When hot, place steak pieces in pot and cook until browned on all sides and internal temperature registers 125 to 130 degrees, 5-7 minutes. Transfer meat to large plate and set aside. Add mushrooms, onion, and 1/2 tsp salt to pot and cook until vegetables begin to brown and dark bits form on bottom of pan, 3-5 minutes. Add tomato paste and flour and cook, stirring constantly, until onions and mushrooms are coated, about 1 minute. Stir in 1/3 cup wine, beef broth and mustard paste (made earlier) and bring to a boil, scraping bottom of pan with wooden pan to loosen browned bits. Slice the browned steak into bite sized pieces and return to pot. When the IP beeps after pressure cooking for 5 minutes, allow your IP to naturally release pressure for 15 minutes. While naturally releasing pressure (also known as NPR or NR), the display will reflect numbers counting up from 1. The numbers indicate how many minutes the IP has stopped cooking since it beeped (or how many minutes it has been naturally releasing pressure). No need to touch your IP while it naturally releases pressure. The pin at the top of your IP will drop when all pressure has been released and it's safe to open. When the display reflects L00:15 (which is 15 minutes since the IP has beeped), turn the setting on top of your IP to VENTING. Doing so allows the IP to quickly release any remaining pressure (also known as QPR or QR). I use a wooden spoon to carefully turn the setting to avoid close contact with the potential steam. You may also want to turn your IP away from cabinets to allow the released steam to escape freely. The pin at the top of your IP will drop when all pressure has been released and it's safe to open. Stir in sour cream and remaining tablespoons wine; season to taste with salt and pepper. Sprinkle with parsley to garnish. Serve over rice, potatoes or buttered noodles.